The cross has been something that means so much to Christians around the world. For men, it is a piece of jewelry that resembles our faith and spirit. Whether that’s a necklace, bracelet, or pendant, you can share your faith in many ways. 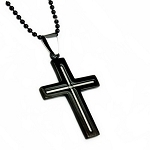 Our selection of men’s cross jewelry includes everything you need to show off your faith. 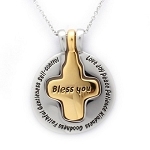 Our selection includes bracelets, necklaces, and pendants that include all types of cross designs on them. Whether you prefer a cross that looks new and edgy, or a classic design that your faith has always represented, we’ve got you covered. 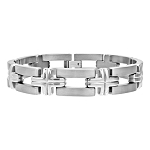 Available in many styles of black and silver, you will absolutely love the way it looks. We have some that look classic and smooth, while others look bold and edgy. 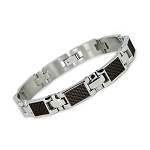 Men’s jewelry continues to expand in many different ways. Popularity has increased for bracelets and necklaces, and you can continue this trend by purchasing one from our incredible selection. 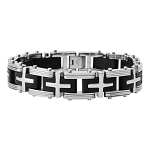 Everything is priced affordably and specifically made for men who appreciate the symbol of the cross. This is something so small but can mean so much to many people. Wearing something you’re passionate about every single day can get you through the hardest days in your life. It can be there as a reminder to keep your faith and stay strong. Whether that’s by wearing a bracelet, or buying a pendant to go along with a necklace, it all applies. If this is something that is important to you, we recommend browsing the options in our selection. Men’s cross jewelry will never go out of style, so it’s something you should feel comfortable buying. We have tons of choices that are fun to wear, affordable, and will represent your faith in a way you’re comfortable with. If you’re not sure what would be best for you, be sure to ask our team, they can always provide a valuable recommendation!